I know that after so many years, you've come to think of me as the provider of a range of stories, from the humorous to the serious, to the outright nonsensical. And while no one likes to hear sad stories, sometimes, it's important for us to come to terms with what's going on in the world. 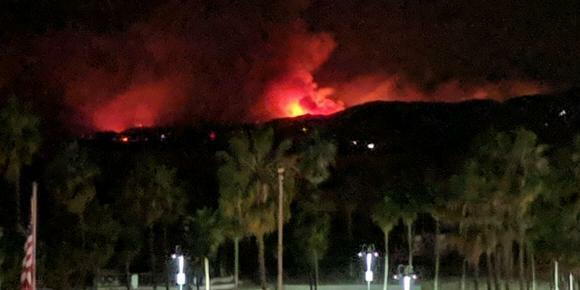 If you're an avid consumer of the news, much like I am, you've been noticing the horrible stories about the wildfires ravaging California, forcing nearly a quarter million people to evacuate their homes and leaving a path of terror and destruction in their wake. It's incredibly sad. And while the first victims on most people's minds are the humans who suffer, there are other victims—animals. I'm talking about animals ranging from domestic pets who lose their homes when their owners do, to the woodland creatures who reside in the forest where these fires are taking place, to animals in nearby zoos who are subjected to the burning smog and smoke coming off of nearby fires. You can take a look at some pictures of these poor creatures here but I do have to warn you all that some people may find them upsetting. So whether you're the type of person who is into prayer, or just about sending good vibes in general, think positive thoughts for both humans and animals alike. And let's all hope these fires subside soon.